A comment on yesterday's post has made it imperative that I follow up with this post today. Americans cannot sue in the United States unless they've registered their copyright with the U.S. Copyright Office. Read this over and over again so the next few paragraphs make sense. Copyright exists from the moment the work is created. You will have to register, however, if you wish to bring a lawsuit for infringement of a U.S. work. Without registration you do not have the ability to sue and get recovery of attorney fees. Once you file you can seek statuary damages as opposed to actual damages. The Berne Convention entered into force in the United States on March 1, 1989 and gives you international protection also. Here are ways that do not give you copyright protection. This won't stand up in court because all you have is an envelope with a postmark and anything could have been put inside of it at anytime. Writers Guild, Copyrightsworld and others. You only have proof you filed the work with them and you've wasted your money because once again it won't stand up in court and give you legal remedies. You can't find out from their web-site.I shouldn't have to work so hard to find out. But I did. The domain registrant is GLOBYWORKS located in London (DE13Gz United Kingdom) and Greece. Bad news for Americans already. They don't register the work in the U.S. So who is GLOBYWORKS? I don't know since I can't make heads or tails of the web-site. It's Greek to me. No, really it's in Greek! What do they do after they take your money? Give you a unique number. Receive the "Certificate of submission". All submitted creations are internally forwarded to CopyrightsWorld's information department. How do they protect your work? Let's look at their terms of service. 5. The model contract contained in www.CopyrightsWorld.com site and the services and products provided thereunder, may be replaced, amended, revoked from time to time by the CopyrightsWorld, at its discretion and in accordance with the legislation. In any case, the signature and / or shipment of such model contracts from potential customers to CopyrightsWorld not constitute an admission by the latter. Visitors to the site www.CopyrightsWorld.com not modify or manipulating the model contracts contained in it or to incite or suggest a third signature in order to claim any kind of compensation from CopyrightsWorld without prior written agreement with the latter. 22. The CopyrightsWorld entitled at any time, without notice, to discontinue or suspend the provision of services, or changing the nature and content. 8. 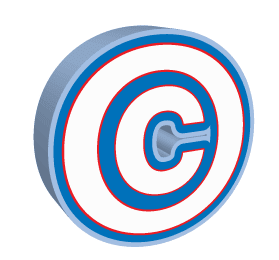 The CopyrightsWorld may, at its discretion to suspend, temporarily or permanently, access or operation of the site www.CopyrightsWorld.com, and to alter in any way the content and form, without prior notice. 12. The CopyrightsWorld offers its customers an online electronic means to use as evidence and potential to prove the paternity of their intellectual work in relation to any judicial or other authority or company or individual, public or private entity. 18. The CopyrightsWorld or representative may not be called as witnesses in judicial dispute membership (provided that it is a certified member) where it relates to intellectual creations you have made to our service. When do you stop paying? This is a pay as you go service. So, you top up your account with credits. You can buy from 1 credit to as many as you need. Credits never expire, so you can use them as you like and only when you need to protect a new creation of yours. Of course, the more credits your buy, the less you pay per credit. To submit a new lyrical creation, for example, you will need just 1 credit. You can purchase them in bundles for up to 59 cents or one by one. It's up to you. So don't waste time and money on these services. I have a couple of inquiries that pertain to my registration. Like, if I'm only registering the first volume of my series, does the volume title have to be under the series title as well or is it even relevant to the registration? And should I also put my original premise/scripts from what came before this revision in the registration as well? Hope to hear from you soon. The title is for your benefit to identify it. You can't copyright titles. You can copyright everything you've written in one shot and call it "My Life's Work up till 2013". The main reason to separate the work is just to make it manageable for yourself so you have the ability to sue someone for infringement and get damages.